Although orange-flesh sweet potatoes (lpomea batata) have traditionally been referred to as yams in part of the United States and Canada, they are not part of the same family and therefore are not true yams. 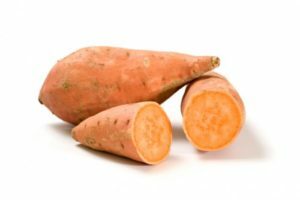 I had no idea there were so many types of sweet potatoes.I also learned that sweet potatoes are more perishable than other potatoes ands what follows are some tips, abbreviated. 1. Handle with care so they don’t bruise, which shortens their shelf life. 3. Do not rinse until ready to use, since moisture will cause them to spoil. 4. Do not refrigerate, as this will cause “chill injury” and will affect the taste. 5. You can store sweet potato slices, cubed or mashed, in a tightly sealed container in the freezer for as long as 6 month. 3. Wash, scrub and peel sweet potatoes into raw strips to enjoy with dips. 5. Substitute sweet potatoes in recipes that call for regular potatoes or apples. Several recipes follow in the brochure, but feel free to scroll down below this posting to the recipes Iposted before Thanksgiving. This entry was posted on Monday, December 5th, 2016 at 1:48 pm	and is filed under Kitchen Nutrition. You can follow any responses to this entry through the RSS 2.0 feed. You can skip to the end and leave a response. Pinging is currently not allowed.